Thanks to your feedback, Swimia has become in just several months one the most very important sites of swimming pools. 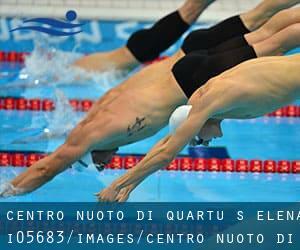 Here you have all of the info we know about Centro Nuoto di Quartu S. Elena, in Cagliari. Don't neglect you can also promote this pool so Centro Nuoto di Quartu S. Elena will appear the first of Cagliari, or perhaps the very first of one's country, get in touch with us to know alot more. Swimmers like you reported 33 meters x 21 meters, 8 lanes, 1.8 meters uniform depth, 1.8 meters uniform depth, Indoors. Phone number and e-mail address are number for this Swimming Pool. Updated on 2019 Via dello Sport 233 , Cagliari , ITALY (Postal Code: 09126). This sports center delivers 25 meters x 20 meters, Indoors. For this Swimming Pool, only phone number is number here. Updated on 2019 Località Terramaini , Cagliari , ITALY (Postal Code: Unknown). This sports center delivers Olympic size, 8 lanes, Indoors. For this Swimming Pool, only phone number is number here. viale Geglielmo Marconi Km 5,400 , Cagliari , ITALY (Postal Code: Unknown). Among all of the activities supplied by the center, in case you are enthusiastic about swimming you can expect to enjoy 25 meters, 6 lanes, Indoors. Just in case you want to get in touch with this Swimming Pool before dropping by, we only know the phone number. Updated on 2019 Viale A. Diaz 227 , Cagliari , ITALY (Postal Code: 09125). Swimmers like you reported 25 meters, 6 lanes. Phone number and email address are number for this Swimming Pool.